Total rainfall for June was mixed with climate observers reporting above and below normal amounts. The wettest areas were scattered across portions of northern and southern Minnesota. Parts of Otter Tail, St Louis, and Winona Counties reported over 6 inches of rain for the month. Minnesota City (Winona County) reported 7.99 inches, their 4th wettest June in history, while Otter Tail reported 7.02 inches, their 9th wettest June in history. Conversely a few weather observers reported less than 1.5 inches of rainfall for the month. Among the climate observation network, 28 new daily record rainfalls were reported, including 2.55 inches at Mora on the 14th and 2.32 inches at Lakefield on the 28th. Numerous reports of wind and large hail were prevalent during June as well. Some damage to crops occurred, but was not widespread across the state. Tornadoes were reported on June 13th in west central counties (Big Stone and Stevens), and in Olmsted County on the 28th. All of these storms were relatively short-lived. A prolonged Heat Wave in the Southwest this month nearly put Death Valley in the record books climate-wise. They reported 10 days in a row with high temperatures of 120 degrees F or greater, and ten nights when the temperature never fell below 92 degrees F. Their mean monthly temperature of over 100 degrees F is the 4th warmest June in history there back to 1911. Similarly Phoenix, AZ reported a mean monthly temperature for June slightly above 94 degrees F. This is their 3rd warmest month of June in history back to 1895. And Las Vegas reported a mean June temperature of 92 degrees F, 3rd warmest in history. 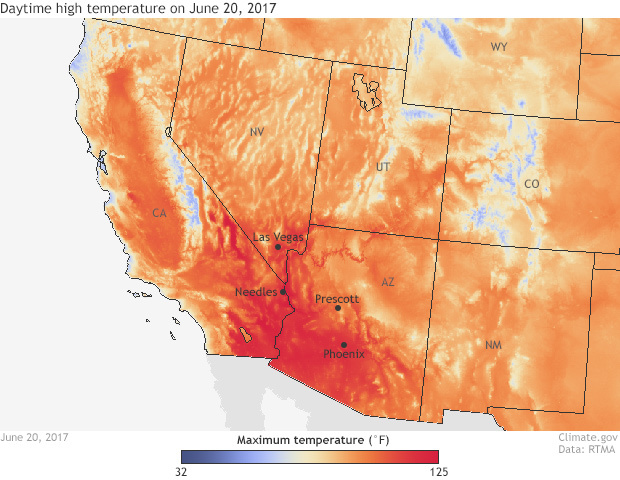 A synopsis of the June Heat Wave in western states is provided by NOAA's Tom Liberto. Another NOAA news feature this week concerns the historical chances of rain on the 4th of July holiday. For most of Minnesota the historical rainfall frequency on July 4th ranges from 1 year in 4 to 1 year in 3. A recent paper in the journal Science estimates the probable economic consequences of climate change county by county across the USA. This is the first paper of its kind looking at potential economic impacts on agriculture, energy, human mortality, and the labor force among other economic sectors. There are major differences across the country, with the largest negative consequences in many of the southern states. A Heat Wave continued across parts of Europe this week, especially around the Mediterranean Sea. In parts of Italy and Greece daily high temperatures were expected to soar above 100 degrees F in many places going into the weekend. Speaking of heat, a new study published in Science Advances documents that climate change may lead to a higher frequency of the co-occurrence of heat and drought. This combination of extremes leads to much higher impacts on human population, especially in terms of health risk and damage to natural resources. A recent paper published in the International Journal of Biometeorology studied the contribution of human and animal metabolism to urban heat islands. They studied data from 26 major cities around the world and found that the contribution of anthropogenic heat from human metabolism ranged from 4-8 percent in mid-latitude cities, while in tropical cities with high population densities it can range from 10 to 45 percent. In Mumbai (formerly Bombay), India, where the population is about 20 million, human and animal metabolic heat generation contributes more to the urban heat island than the production of electrical power. The United Kingdom Met Office is experimenting with a new online weather course that is available to the public starting this September. It will run for four weeks and require about 3 hours of activities each week. They will teach basics of observation and interpretation of maps and reports. The course is free and may be of interest to farmers, gardeners, hikers, photographers, and those who sail. There is also an interesting article from the National Health Service in the United Kingdom about sun-care for young children during the summer months. Many parents may want to read this in order to understand protection measures for their children from getting burned or too much summer sun. There are good reminders in this article worth paying attention to. My 5th grader wants to know how high the thunderstorm clouds are typically over Minnesota? I know that probably varies with the strength of the storm, but what is the average? The depth of thunderstorms varies both with their strength and the latitude in which they form. Over Minnesota (about 45 degrees north latitude), average thunderstorm tops can range between 35,000 and 45,000 feet. In some extreme cases, with supercell thunderstorms cloud tops have approached or exceeded 60,000 feet at our latitude. At lower latitudes, especially in the tropics, strong thunderstorm cloud tops have exceeded 70,000 feet. Conversely in the polar latitudes, like over Hudson Bay, Canada, extreme thunderstorm cloud tops may approach 35,000 feet. For access to weather radar online that provides estimates of cloud top heights you can use the College of Dupage radar site mapping utility. Click on the radar map, then go to the drop down menu on the left of the page on click on "echo tops." The average MSP high temperature for this date is 83 degrees F (plus or minus 9 degrees F standard deviation), while the average low is 63 degrees F (plus or minus 7 degrees F standard deviation). MSP records for this date include: highest daily maximum temperature of 100 degrees F in 1931; lowest daily maximum temperature of 56 degrees F in 1959; lowest daily minimum temperature of 47 degrees F in 1892; highest daily minimum temperature of 82 F in 1931; record precipitation of 1.56 inches in 1978. No snowfall has occurred on this date. Average dew point for June 30yh 21st is 58°F; the maximum dew point on this date is 76°F in 1955; and the minimum dew point on this date is 36°F in 1965. The all-time state high temperature for today's date is 109 degrees F at Canby (Yellow Medicine County) in 1931; the all-time state low for today's date is 24 degrees F at Pine River Dam (Crow Wing County) in 1925. The all-time state record precipitation for this date is 5.34 inches at Faribault (Rice County) in 1901. No snow has fallen on this date. By far the warmest June 30th in state history was in 1931. Over 35 Minnesota communities reported an afternoon high of 100 degrees F or warmer, topped by 109°F at Canby. Seven cities, including the Twin Cities, never saw the thermometer drop below 80 degrees F even at night. Many people slept outside in parks, or near lakes. In the middle of the drought of 1988 June 30th brought a frost to many portions of northern Minnesota. Observers in Carlton, St Louis, Kanabec, Aitkin, and Lake Counties reported frost on the morning of June 30th. Some gardens suffered, but agricultural crops were not seriously damaged. Persistent thunderstorms brought very heavy rains to many parts of southern Minnesota over June 29 to July 1, 1993. Observers in southwestern Minnesota saw rains of 3 to 5 inches flood roads and fields. That summer brought the 2nd wettest combination of June and July in state history, with average rainfall over the two months totaling over a foot. Slightly cooler than normal temperatures over the weekend, under partly cloudy skies, with chances for showers in the far north. It will be warming up on Monday with temperatures a few degrees warmer than normal, and a chance for widely scattered showers late in the day. Generally sunny on the 4th of July, with afternoon highs ranging from 75 to 85 degrees F and a slightly chance for showers. Continued sunny and warm for the balance of next week.